Tsim Sha Tsui (Chinese: 尖沙咀; Cantonese Yale: Jīmsājéui) is an MTR station on the Tsuen Wan line. The station, originally opened in 1979 on the Kwun Tong Line, serves the area of Tsim Sha Tsui. East Tsim Sha Tsui station on the West Rail line, which opened on 24 October 2004, is connected to this station by underground pedestrian passages. The two stations serve as an interchange point between the Tsuen Wan and West Rail lines. The station was built underneath Nathan Road in the late 1970s. The site of Exit A1 was once the vehicular entrance to Kowloon Park, which was relocated to Haiphong Road. The station opened on 16 December 1979 as part of the Modified Initial System. Service was extended southward, across the harbour, on 12 February 1980. 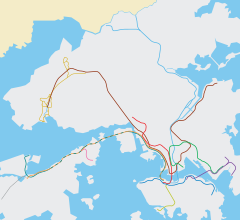 Before the Tsuen Wan Extension opened, the single line of the MTR traveled from Central to Kwun Tong (whereas today all northbound trains from Tsim Sha Tsui go to Tsuen Wan). The station concourse was renovated in 1986. Tsim Sha Tsui Station was featured in Clifton Ko's 1987 film, It's a Mad, Mad, Mad World. It also appeared in a brief chase sequence featuring Brigitte Lin in Wong Kar-wai's 1994 film, Chungking Express. Modification work were undertaken from 2002 to 2005 to facilitate new pedestrian subway connections between this station and the new East Tsim Sha Tsui Station, built nearby by the KCR Corporation. The contractor was Kumagai Gumi. The work involved reconfiguration of the concourse and various station upgrades. Exit A1 was rebuilt from 2014 to 2016 to provide a new lift and enlarge the access. During construction a temporary exit was provided. The permanent exit reopened on 7 May 2016 with a "crystal cube" design, replacing the old concrete structure, that houses the lift, two escalators, and stairs. In December 2013 construction began on a redesigned Exit D. A new passage was built to connect to the K11 shopping centre, aiming to relieve congestion in the southern end of the station concourse as well as the Mody Road Subway. The new passageway opened on 30 November 2018. On 10 February 2017 a Tsuen Wan-bound train was the site of an arson attack in which 19 people were injured. A 60-year-old man suffering from mental illness shouted, "My son was killed. I shall burn with you all," and set himself ablaze in the packed train. He had had a son from his first marriage, who had died in an incident. The train operator managed to drive it to Tsim Sha Tsui for evacuation. The station was closed after the incident and was reopened next morning. The suspect died from organ failure three months later and was the only casualty. Platforms 1 and 2 share the same island platform. Out-of-system access to the West Rail Line is provided at the concourse through exits F or G and a walk along the Middle Road or Mody Road subway system respectively to reach East Tsim Sha Tsui Station. Although Tsim Sha Tsui Station and East Tsim Sha Tsui Station are connected, the fare gates of these two station are separated. Single journey ticket passengers transferring from Tsuen Wan Line to West Rail Line must purchase a second ticket at East Tsim Sha Tsui Station as the first ticket is withdrawn, without refunding the remaining value in the ticket, once the passengers exit through the turnstiles at Tsim Sha Tsui Station. In contrast, Octopus card users who transfer between Tsim Sha Tsui and East Tsim Sha Tsui stations within thirty minutes without making any other transport-related purchases or more than nine non-transport related purchases in between stations are considered to have taken a single journey and are charged accordingly. Tsim Sha Tsui station is linked with East Tsim Sha Tsui station through the Mody Road and Middle Road subways. Though the stations are independent from one another, they share a common exit naming scheme to avoid confusion. Underground pedestrian passages to West Rail Line trains to Hung Hom and Tuen Mun. ^ "Effect of Tsim Sha Tsui Mass Transit railway Station on Kowloon Park and roadside trees". Urban Council. 16 April 1974. ^ "MTR station work starts". South China Morning Post. 1 September 1986. p. 22. ^ "Entrance A1 at MTR Tsim Sha Tsui Station Making Way for New "Crystal Cube" and External Lift" (PDF). MTR Corporation. 15 January 2014. ^ ""Crystal Cube" Becomes a New Landmark for MTR Tsim Sha Tsui Station Entrance A1" (PDF). MTR Corporation. 6 May 2016. ^ "New Pedestrian Subway and Entrance at MTR Tsim Sha Tsui Station Enhance Connections" (PDF). MTR Corporation. 30 November 2018. ^ "港鐵縱火案4危14傷 狂徒曾高叫一鑊熟". 大公報. 11 February 2017. Retrieved 7 March 2018. ^ "【港鐵縱火】疑犯80年代來港　曾有暴力行為確診患妄想症　與前妻所生兒子已離世". 明報. 11 February 2017. Retrieved 7 March 2018. ^ Blundy, Rachel (12 February 2017). "Man charged with arson after Hong Kong MTR attack leaves 19 commuters injured". South China Morning Post. ^ "Arson in Tsim Sha Tsui MTR Station". www.info.gov.hk. 11 February 2017. Retrieved 25 November 2017. ^ "消息指港鐵縱火案被告　留院3月後今晨不治". 頭條日報. 14 May 2017. Retrieved 7 March 2018. ^ a b c "Tsim Sha Tsui Station street map" (PDF). MTR Corporation. Retrieved 30 July 2014. ^ "Tsim Sha Tsui Station layout" (PDF). MTR Corporation. Retrieved 30 July 2014. This page was last edited on 16 February 2019, at 11:26 (UTC).